Eric Clingen graduated from the University of Pennsylvania in 1978 with a B.A. in Anthropology. After working in furniture building and restoration in Philadelphia, he joined the U.S. Forest Service in California to work in his academic field of Archaeology. As a professional archaeologiest, he also worked for the University of California at Santa Barbara, and the National Park Service in Boston and Cape Cod. At South Street Seaport in New York City, he excavated a buried 200 foot ship that had been scuttled for landfill in 1730. There he met his wife to be, Kerry, 20 feet underground. In 1984 he joined the National Trust for Historic Preservation at the Lyndhurst Estate in Tarrytown, N.Y. and restored several important historic buildings, from Gracie Mansion to Frederic Law Omsted’s gazebos in Central Park. 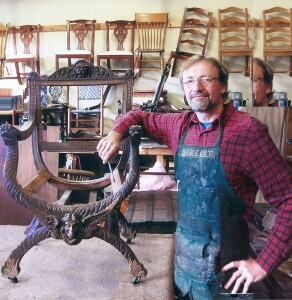 After starting a family, he established his restoration studio in 1985, where he has since restored several thousand antique and vintage pieces. Eric invites you to contact him with questions about repairing your treasured antiques or wooden art objects.